1920 – year of the war with Poland. In the early months, the Red Army’s victories against the White Guards won a breathing-space in which it turned to assist in the reconstruction of the war-torn economy. 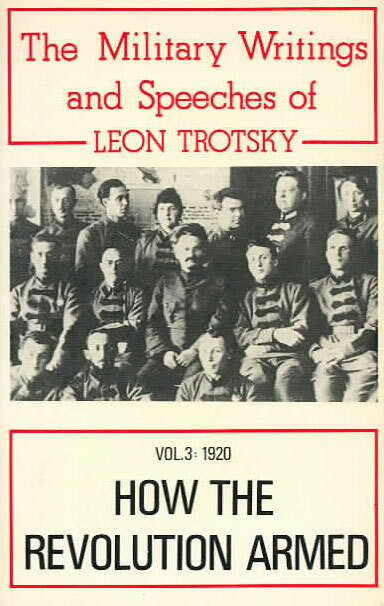 The first Labour Armies were formed under Trotsky’s direction. Then came the Polish offensive. The Soviet Republic replied by swelling the ranks of the Red Army to five million and launching the contentious march on Warsaw. Beaten back outside the Polish capital, the Soviet forces nonetheless regained lost territories, enabled the Bolsheviks to conclude a peace, and proceeded in the South to sweep the counter-revolutionary Wrangel into the sea. The third in a five-volume series, this book is part of an imperishable record of the struggle to defend the Soviet state in the years following the Russian Revolution. Long suppressed in the Soviet Union, these writings and speeches of the leader of the Red Army are here published in English for the first time. First Published: 1924 as Book Two of Volume II of Kak Vooruzhala Revolyutsiya, by the Supreme Council for Military Publications, Moscow. Source: Materials and Documents on the History of the Red Army, The Military Writings and Speeches of Leon Trotsky: How the Revolution Armed, Volume III: The Year 1920, New Park Publications, London, permission for publication on the Trotsky Internet Archive given by holders of the copyright, Index Books, London. Translated (and edited) and Annotated: Brian Pearce. Online Version: Leon Trotsky Internet Archive, 2002. 7. Bread for the Hungary! Fuel for the Cold! 8. Who is Ruining Transport? Who is Destroying the Railways? Who is Condemning the Population to Hunger and Every Other Form of Hardship? 18. Death to the Polish Bourgeoisie! 27. Kiev is in the Hands of the Polish Gentry! 29. What Do They Want? 33. For the Soviet Ukraine! 51. Is a Second Lesson Needed? 56. Peace With Poland Has Been Achieved! 57. Woe to Those Who do not Carry Matters to a Finish! 69. What is the Meaning of Makhno’s Coming Over to the Side of the Soviet Power? 73. How is Makhno’s Troop Organised? 75. Let This be the Last! 76. Don’t Let Them Get Away! 90. Which Government is the More Stable? 99. Firing, or Making a Noise? 105. What is a Good Regiment and What is a Bad One? 107. Proletarians of All Lands, Comrade Workers! 116. Take Care of the Wounded and Sick Soldiers!